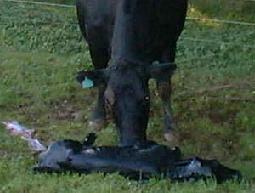 Below are a series of pictures taken of a cow giving birth to her calf. The whole process in this case took less than four minutes. 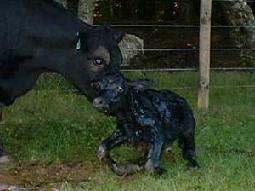 The calf was the fourth born to this cow. Finally, the first steps, which often lead to involuntary summersaults and a great deal of flopping about in the mud. The calf is usually up and about reasonably steadily within half an hour of its birth. See also #32 calving and Onix Calving. Need more information? Email us with your questions.